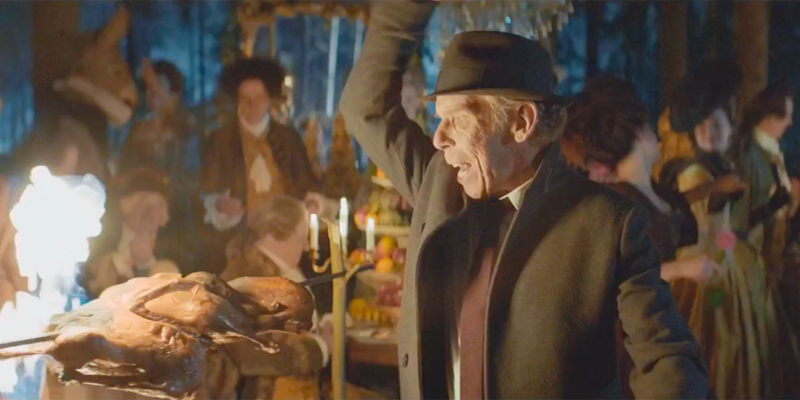 Jung von Matt turned to actor Christopher Fairbank to deliver an epic ode to the art of grilling meat over an open flame to promote German supermarket chain Edeka. Fairbanks’ monologue in the spot, titled “Men of Fire,” takes a look back at the history of the barbecue—way back, since cooking meat over an open flame was essentially mankind’s first form of meal preparation. And he seems pretty darn serious about it. “In the beginning, there was fire kindled by lightning from heaven,” Fairbank begins. “It burned and it blazed, flames without tire, and maketh boys into men” he continues as he walks past a scene of cavemen cooking over an open flame. But, Fairbank says with a shift in tone, what passes for a barbecue today? It turns out he’s no fan of salads, “ridiculously sparkling drinks” or “pretentious artisanal trending cuisine,” and he’s brought along the hordes of history to crash the party. Of course, the insight that grilling over an open flame evokes primitive and instinctual feelings—pointedly among men—is nothing new, but this long-form spot takes it to a commendable extreme. It’s also worth pointing out that the barbecue isn’t the same cultural institution in Germany as it is in the states, so the trope of harnessing fire is likely less overused than it would be to a U.S. audience. Fairbanks’ delivery ultimately makes the (intentionally) over-the-top approach, as he seems convincingly serious about the subject at hand. While there’s room for criticism of the spot’s gender stereotyping and lack of culinary nuance, you could also argue those traits are tied to the ad’s intentionally overwrought style. In the end “Men of Fire” employs an entertaining approach with a comical payoff that lets viewers know not to take it to seriously while also underscoring the appeal of grilling outdoors. The spot is far from the first piece of attention-grabbing work Jung von Matt has crafted for Edeka, and not nearly the most controversial. In 2015, the agency launched a holiday spot featuring a father tricking his children into coming home for the holidays by pretending he was dead. Not everyone appreciated that approach, but it did net the brand a whole lot of views on YouTube and Facebook.